Hun Sen claimed victory in Cambodia’s elections in the shadow of last year’s dissolution of Cambodia’s main opposition party and the blanket ban on 118 political opponents. Last year’s dissolution of Cambodia’s main opposition party and the blanket ban on 118 political opponents by the Cambodian Supreme Court was an annihilation of democracy and an abuse of human rights in Cambodia. The UN Human Rights Council, joined by Australia and 45 other countries, condemned Cambodia, and the situation was described by former Australian High Court judge the Hon Michael Kirby AC CMG FAIIA as “extreme”. The US imposed targeted sanctions following the passing of the Cambodia Democracy Act 2018 for gross violations of human rights as guaranteed and enshrined in the Paris Peace Accords 1991. As the election is underway on 29 July, Australia and the international community are urged not to recognise Prime Minister Hun Sen and his regime as a legitimate incoming government. Four Corners ABC will screen a documentary on 30 July that uncovers Hun Sen’s networks in Australia which warrants all government agencies and regulators to investigate money laundering, abuse of the visa system for students and Hun Sen’s ruling elites accessing the community in Australia. Additionally, given the level of gross systematic abuses of human rights by the current ruling regime stretching back to 1997, Australia and the international community are urged to stop funding the Khmer Rouge Tribunal. Human Rights Watch has been calling for many years for donor countries and the UN to cease funding. Documented crimes committed by Hun Sen against innocent Cambodians warrant a creation of a tribunal to try Hun Sen and members of his ruling regime. Keeping politics aside, morally and ethically it makes no sense to spend millions of dollars to try historical offences committed by few remaining members of the Khmer Rouge 40 years ago. The crimes committed by the ruling regime are so extreme that they must not be overlooked. 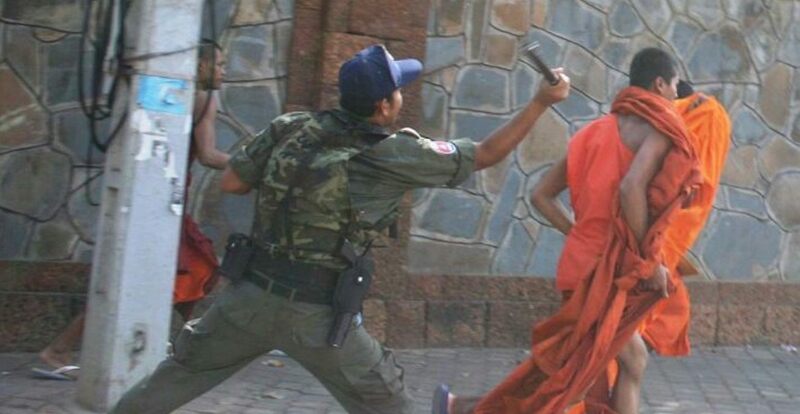 In the past few years, former foreign minister Professor the Hon Gareth Evans AC QC FAIIA has called for diplomatic sanctions against Cambodia, saying that its government “has been getting away with murder”. In 2012 a report by Nate Thayer openly called Hun Sen and his cabal “murderous, corrupt thugs”. NGOs and independent legal experts have given pro bono services: Richard Rogers, a British lawyer, filed a case before the International Criminal Court on behalf of land-grab victims. Last week, Global Witness issued a report calling on four of Hun Sen’s tycoons be sanctioned and Human Rights Watch compiled a list of 12 of Hun Sen’s generals to be blacklisted. At the heart of the issue is the blatant annihilation of the legal system and judicial organ by Hun Sen and his regime. The dissolution of the main opposition party coupled with a blanket ban on 118 political activists is indicative that the Cambodian legal system is “so extreme” that Australia and the international community must undertake coordinated measures against Hun Sen and the ruling party. Australia, like many other developed nations, has spent hundreds of millions of dollars to improve Cambodia’s legal system. The Department of Foreign Affairs and Trade, in its 2012 report, Cambodia Justice Sector Delivery Strategy, identified that: “Challenges remain, however, in establishing a fair, transparent and accountable legal and judicial system in Cambodia. Patronage and corruption are widespread in the system.” Despite these signs, Australia has continued to provide assistance in the field of legal justice. This sea-change is unlikely to take place so long as the Australian legal community and the Australian Federal Government continue to afford the legitimacy to Hun Sen and his loyal supporters. Cambodia is an empty state without its ally China. But China alone will not be able to feed the legitimacy granted by Western countries, that is craved by Hun Sen and his cronies. For that reason, future cooperation including judicial and legal bilateral contact with Australia should be strictly restricted until Hun Sen shows sign of basic respect for his own judicial system. History has shown that over the last three decades Australian taxpayers have spent hundreds of millions of dollars to improve education amongst Cambodian professionals. But once they returned home, the influence of patronage and fear of a dictator overpowered their skills and qualifications gained while in Australia. Even if they wish to implement their skills, the result is virtually impossible to achieve because the entire system is dictatorially abused. 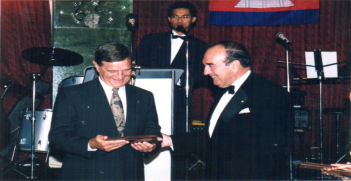 The best way for the Australian legal community and the Federal Government to move forward is to learn from the past mistake made by the UN in trusting Hun Sen’s promises that he would deliver democracy to Cambodia and adherence to the Paris Accords. As members of the Cambodian community diaspora, we urge the UN and the international community to seriously start engaging of creating a tribunal to try members of Hun Sen’s ruling party. 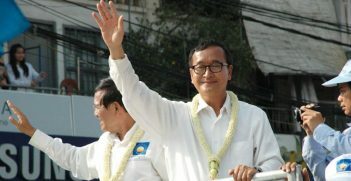 Australia should continue to be involved in Cambodia’s democracy. In the words of Amnesty International: “Don’t Leave Cambodia to fight democracy alone”. Targeted sanctions in the area of education and defence cooperation and bilateral contact should be in place until the current regime shows genuine signs of structural reform in government departments and the judiciary. Foreign aid and diplomatic cooperation should be conditional upon Cambodia introducing pedagogy and initiatives in the area of human rights education in accordance with the Vienna Declaration and Programme of Action. 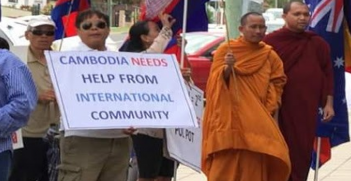 Until then, Australia’s diplomatic relations with Cambodia provides legitimacy for this dictatorial regime to continue abusing human rights and committing unspeakable crimes against its own people. Sawathey Ek OAM is a lawyer, Principal of E K Lawyers (Sydney) and Spokesperson for the Cambodian Action Group and Cambodian Australian Federation Inc. Sawathey is a former refugee from Cambodia in 1983 and recently has been successfully coordinating with federal Cross Benchers, the Greens and the Labor Party to secure a motion passed in the Federal Senate on 25 June 2018. The international community can play a vital role in reviving good governance in Phnom Penh. In the past, Australia has been central in promoting Cambodian democracy; will it step forward again?